I have been craving curry recently. It has been a while since I made a curry of any description, although I have made few spicy soups. 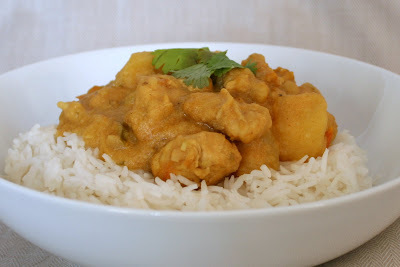 When searching around for recipes, I found this one on the BBC website by Manju Malhi which caught my attention, mainly because I had pretty much all the ingredients already to hand, and also because it looked particularly quick and easy to make. This recipe tasted great, and was extremely easy to do. I tend to do all the preparations before I start cooking, that way I can just empty the various bowls of ingredients in, TV-style, as I'm going along. It means I have more bowls to wash up, but it helps me to not forget any ingredients and make sure things go into the pot when they're supposed to. Heat up 3 tablespoons of the oil in a heavy based pan and saute the Onion and Chilli for a few minutes. Then add the Ginger, Garlic, Chilli Powder, Coriander, Turmeric and Salt and stir into the Onions and once all covered, add the Chicken and fry gently for about 8-10 minutes. If the pan gets too dry and stuff starts to stick to the bottom, add a dash of water. Next add the Tomato and Potato and stir in for another couple of minutes before adding about a third of the Coconut Milk along with about 200ml of boiling water. Leave to simmer for about 6 minutes, then add the remaining Coconut Milk and further simmer for about 10 minutes until the potato and chicken are cooked. Then sprinkle of the pinch of Garam Masala. I served this with Basmati Rice and garnished with some, maybe, overly browned shallots and curry leaves, however, for the photo, I just stuck a couple of Coriander leaves on top, because the shots with the onion just didn't look as nice.